This growing trend was just the beginning, and the promise of what continues to be a great future. What continues is more hybridization and selection with cold tolerance in mind and then regional testing accompanied by reporting so that all may benefit by the experience of others. A little back-ground information will help you to evaluate the possibility of growing camellias in your area. The various species of most plant families vary considerably in their adaptability to environmental factors. Closely related varieties vary in requirements for soil types, pH values, mineral elements, moisture and resistance to cold, insects and disease. Varieties of wheat are selected for fall or spring planting partly because they vary in their tolerance to cold. Peaches, apples and pears may be selected to tolerate cold, moderate, or warmer areas. Citrus species are considered semi-tropical but there are a few types which grow in cold areas. The genera and species in the great family of theaceae, of which the camellia is one, cover a wide range of tolerance. Within the camellia genus there are many species and varieties with great variation. When species are crossed the resulting hybrids will vary in many respects. The problem then is to produce or select varieties to meet certain requirements. Within the last few years selection of camellia varieties with greater cold tolerance has received attention from both commercial and amateur growers. There are probably many stray camellia plants grown in back yards all the way from Florida to New York. No doubt many attempts to grow camellias up North have resulted in failure. My grandfather first attempted to grow camellias in New York back in 1928 with plants propagated from cuttings sent from the campus of the University of Washington. They succeeded and grew well until 1932 when they were badly damaged by severe winter weather. The temperature dropped to at least 20° below zero. However, the plants were not killed; after a severe pruning they made a compact growth and produced a good crop of flowers the following spring. Of course as Gramp’s said “The winter of 1932–1933 was severe enough to damage or kill many species of hardy plants.” Privet hedges, climbing roses, some varieties of peach, rhododendron, laurel, holly and azalea were either killed or damaged. Since that severe winter, rhododendrons and azaleas have had damaged leaves and branches when none appeared on the camellias. 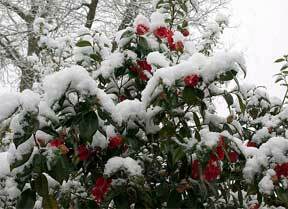 In some places and on some varieties of camellias both leaves and flower buds were damaged. At the same time some varieties were not injured. Camellias can be grown in many parts of Long Island and New Jersey is reason for encouragement, and the fact that they have withstood even lower temperatures than generally occur in these areas is a good indication of their potential hardiness. There should be a concerted effort on the part of all camellia lovers and societies to establish test gardens from east to west and south to north. There are thousands of named varieties to start testing and new seedlings are being introduced each year.